Make your wedding celebration memorable with the help of Hollywood Casino St. Louis. We offer full-catering and specialty wedding packages so you can focus on loving, cherishing and partying all night long. Call 855-781-3054 for pricing or to book a date or schedule a tour. Ready to say "I do?" You'll find the perfect place to host your wedding reception, wedding ceremony, rehearsal dinner, bachelor / bachelorette party or bridal shower at Hollywood Casino St. Louis. 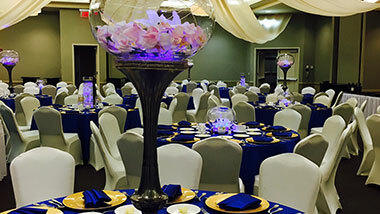 Whether it's a large celebration featuring friends, family and more, or a small intimate ceremony, you'll find the event space you need at Hollywood. We offer four different wedding packages at different price levels. 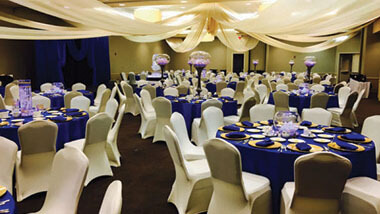 With a total of 8,000 square feet of flexible event space, we can accommodate wedding receptions with up to 200 guests. View available event space layouts. You can also request assistance with planning, set up and audiovisual equipment from our experienced staff. Call us at 855-781-3054 or email STL.Meeting_Event@pngaming.com for pricing, reservations or even to request a personalized tour of our available space. Relax and take a seat, Hollywood provides all of your guests with our wonderful on-site catering menu that includes white linen service, cocktail receptions, ice sculptures, build-your-own buffets and even late-night, after-party snacks. We'll also assist with your audiovisual needs, from microphones and sound systems to video screens. You won't have to travel far before or after the ceremony, either, thanks to our newly renovated, 502-room hotel offering suites and standard luxury rooms as well as a complimentary fitness center. Hollywood Casino St. Louis is conveniently located 10 minutes from St. Louis Lambert International Airport, just off Interstate 70. We offer a complimentary airport shuttle and complimentary valet and on-site parking in our covered garage. Get answers to the most frequently asked wedding questions. Be inspired by this selection of photos from wedding receptions held at Hollywood Casino in St. Louis. You'll have endless ways to personalize your wedding reception, rehearsal dinner, bridal shower or bachelorette party when you hold your event at Hollywood. Choose from a selection of in-house table decorations or supply your own unique centerpieces, bouquets and quirky or elegant decorations. Have photos of your Hollywood wedding that you'd like to share? Email them to STL.Meeting_Event@pngaming.com. 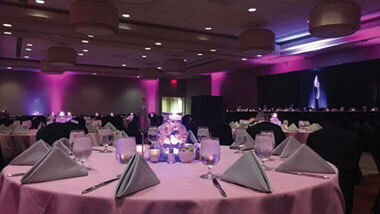 This event space is great for receptions or small- or medium-size gatherings, and is located closest to our hotel rooms. The Melrose Room features 12-foot-high ceilings and measures 40 feet by 40 feet, with a total square footage of 1,600 feet. It fits 70 tables with 10 seats at each. The Melrose Room can be broken up into two separate spaces measuring 800 square feet each and accommodating 30 10-seat tables. 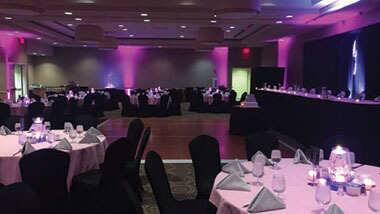 This circular room can feature a massive projection screen or be split for two different functions at one gathering, such as a reception and banquet. Totaling 1,900 square feet and measuring 50 feet by 51 feet, the Rotunda Room can accommodate 80 tables with 10 seats at each or be set up for a cocktail reception of up to 175 guests. Seating can also be set up in a theater, conference, classroom or u-shape design. Perfect for wedding receptions, business events, conferences or any type of gathering, the conference room is the largest event space at Hollywood Casino in St. Louis. It measures 89 feet by 51 feet with a total square footage of 4,501 and seating for up to 350 people depending on the configuration you choose. It can also be paired with the Rotunda Room if you need more capacity or broken down into seven smaller spaces to fit your individual need. 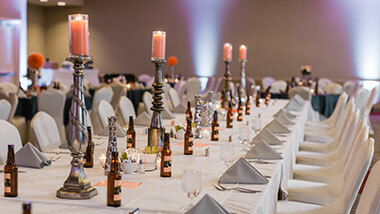 Looking for a less traditional event space for your wedding reception? 99 Hops House at Hollywood Casino St. Louis offers options for dining with space for personalized displays on every wall. The Private Dining space can seat 50 - 60 guests, totaling 1,088 square feet. Need more space? Choose the restaurant buy out option that can seat up to 100 guests! You can show your guests anything that comes to mind. We have wedding packages that fit any budget for any size wedding. Choose from a cocktail reception with light fare, an all-you-can-eat buffet, or a plated dinner service with waiters. We also offer upgrades that can make any wedding or reception feel a little more glamorous, such as ice sculptures, wine service and more. 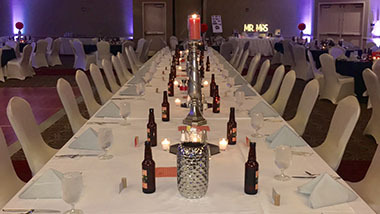 We also offer rehearsal dinner and bridal shower packages for small and large gatherings featuring plated or buffet style meals, open bars and more to make your event truly special. 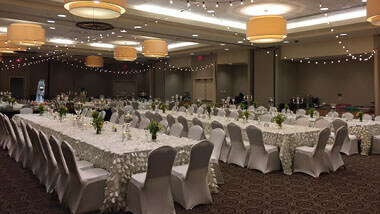 Plus, our upgrades can be added to any wedding event. All our wedding, bridal shower and rehearsal dinner prices are subject to a 21 percent taxable service charge and applicable sales tax. You can select six hors d'oeuvres plus a cheese and vegetable display with this package. Upgrade the hors d'oeuvres to include a macaroni and cheese bar, pasta station or carving station featuring turkey or top round of beef. All entrees include one starch, one vegetable, and dinner rolls. All buffets include iced tea, water, coffee and freshly baked rolls plus a choice of two salads, choice of three entrees and a choice of three sides. You'll also receive 1 1/2 hours of service. See the full menu of buffet options here. Hotel suite for the bride and groom on the wedding night. Golden Age: Two-hour open bar with top-shelf brands, beer, wine and soda. Talkies: Two-hour open bar with house brands, beer, wine and soda. Silent Era: Price includes two-hour open bar with beer, wine and soda. buffet, chicken entree, duet entree (filet and chicken). All bridal shower packages include: tablecloths, napkins, and centerpieces from in-house selections, and gift table(s). This package includes a brunch buffet, coffee, iced tea and water service. One hour of butler-passed champagne, mimosas and Bellinis. Your guests can choose one of the following menu items. Sandwiches/wraps come with petite salad, chips, choice of dessert, iced tea, water, champagne punch and coffee service. Choice of two. One hour of service. Liquor: Tito’s, Captain Morgan, Bacardi, Crown Royal, Bombay Sapphire, Jack Daniel’s, Maker’s Mark, 1800, Chivas, Disaronno, Peach Schnapps & Malibu. Beer: Budweiser, Bud Light, Bud Select, O’Doul’s, Heineken, Corona, Angry Orchard, Sam Adams seasonal and a variety of local craft brews. Wine: Chardonnay, Moscato and Merlot. Liquor: Smirnoff, Seagram’s 7, Jose Cuervo, Bacardi, Jim Beam, Dewar’s, Bombay, Seagram’s VO, Captain Morgan, Amaretto, Peach Schnapps & Malibu. Beer: Budweiser, Bud Light, Bud Select, Heineken, Corona, Angry Orchard, Sam Adams seasonal and a variety of local craft brews. Wine: Chardonnay, Pinot Grigio, Moscato, Riesling, White Zinfandel, Cabernet, Merlot & Pinot Noir.